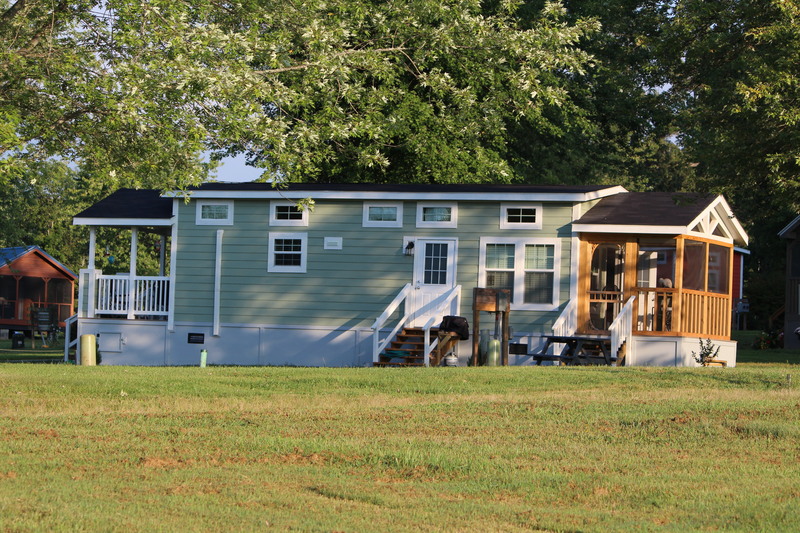 Livin’ large in a Tiny House: Flat Rock, NC | Oh, the Places We See . . .
Our home away from home: a tiny house in Flat Rock, North Carolina. When you wait ’til the last minute to make hotel or B&B reservations wherever there’s a huge festival, you just may be out of luck. And we were. No rooms in Hendersonville, North Carolina, during Apple Festival 2016. Sold out. Nothing much on any of the tried-and-true websites we rely on for lodging. And that’s when we got creative. Somehow we stumbled upon the Village of Wildflowers in nearby Flat Rock. Nice website. Lovely photos. Tiny houses. That’s right — those adorable tiny houses that you see on HGTV’s Tiny House Hunters. We signed up and stayed in a tiny house called Lake View. Fully-equipped kitchen in a rentable tiny house in Flat Rock. 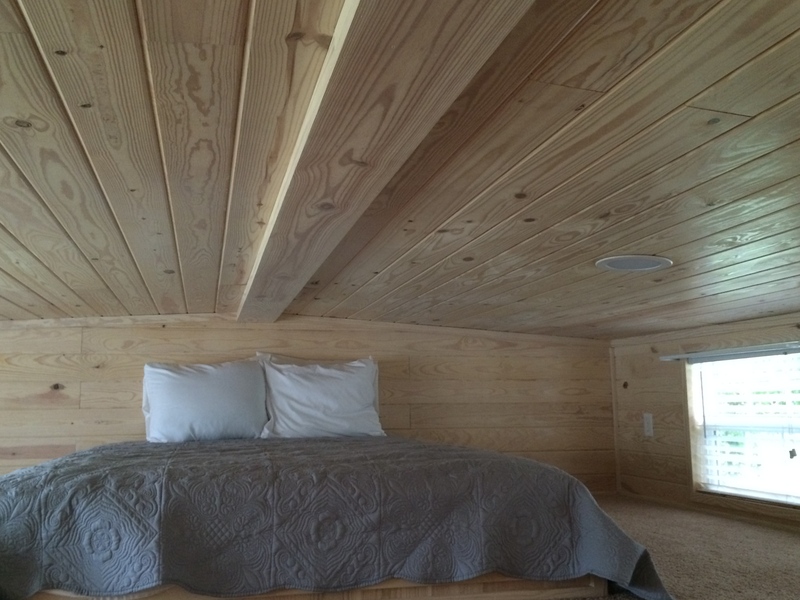 Our 400-square-foot tiny home offered more than ample accommodations for three nights. Immediately, we loved the open living room with natural pine walls and all the amenities you’d want in a compact space: sofa, two chairs, bar with pull-up stools, fully-equipped kitchen, fireplace, and big flat-screen TV. One corner of the living room with fireplace and TV — visible from kitchen. The master bedroom was another study in usable space: queen bed with storage underneath, book shelves on either side of the bed, and a wardrobe with hanging space and deep drawers. Plenty of storage in this comfortable, compact master bedroom. No compromises on the bathroom either: full tub with shower and lots of lighted spaces. Pocket doors kept everything private but stayed out of the way. Loft space (accessible by ladder in the living room) held another queen bed in a spacious carpeted area. We didn’t venture up there except to peek in, but we knew at first glance that kids would love this space! Ladder from living room to loft — and lots more space! The loft bedroom — great space, but don’t stand up! A screened-in porch with four chairs offered a view of the lake and a quiet place to read. But we also discovered something else hidden away behind closed doors on the porch: a compact washer and dryer. Handy, to say the least. Screened-in porch holds 4 chairs. Hidden away behind doors is the washer and dryer. 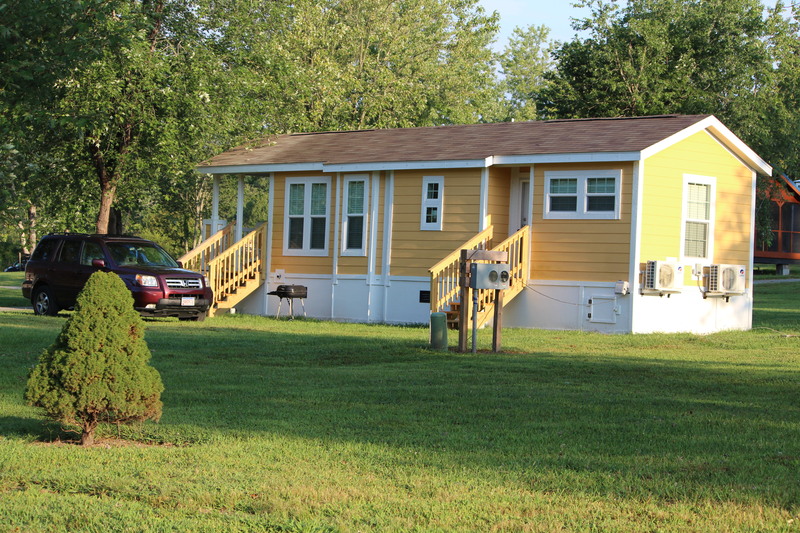 The Village of Wildflowers has both permanent residents and rental homes in this tiny house subdivision where variety in design and building materials ensure that no two are alike. Open for inspection was an even tinier house, suitable for toting behind a vehicle if the owners wanted to be on the move. 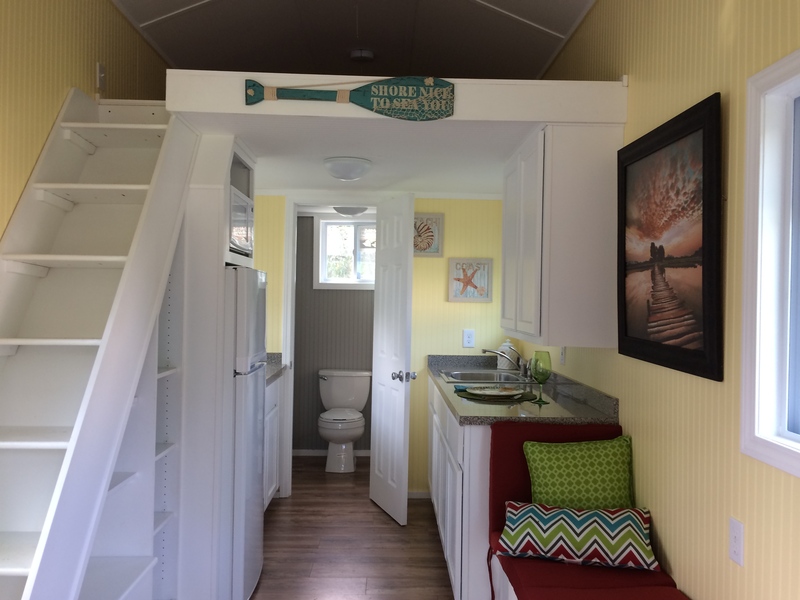 Inside the ground floor of a portable tiny house with a beachy theme. 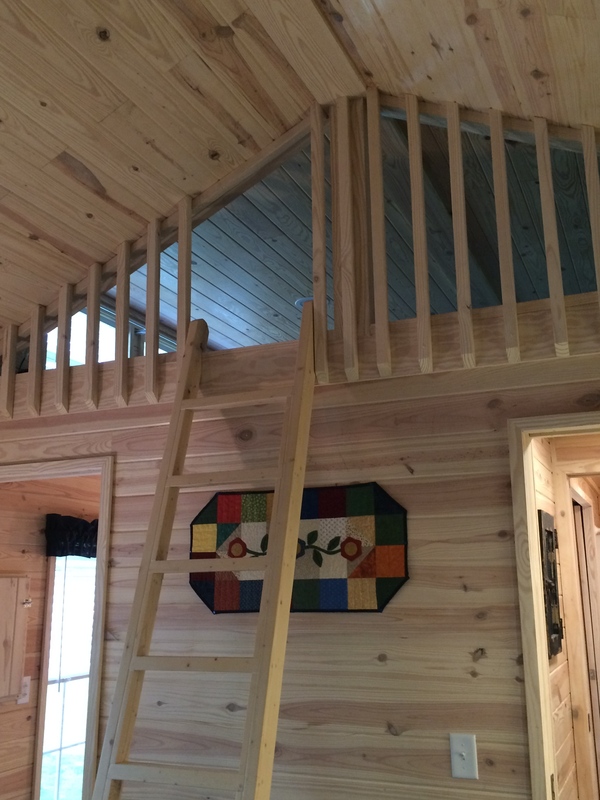 Stairs lead to loft sleeping area. For us, staying in a tiny house has its advantages: We were in one place for three days of exploring western North Carolina, we “cooked in” a couple of nights, and we gave up nothing in terms of accommodations. We’re convinced that there may be more of these tiny house communities on the way in America, and, as an alternative to our usual hotels and bed-and-breakfasts, our tiny house stay felt like an adventure, one worth trying. What about you? Think you’d enjoy a tiny house vacation? This entry was posted in North Carolina, Stay the Night, Travel and tagged Flat Rock, North Carolina, tiny house, tiny houses, Village of Wildflowers. Bookmark the permalink. Hope you do build that tiny house you’re dreaming of. We have watched a show on HGTV for a while, and now we wish we could build one. Best wishes to you!! That’s look good. But is it easy for two people to live in there? I love the idea of less maintenance, Cleaning and bills but is it comfortable for two adults? You ask great questions, and here’s what we know: It was easy for us to rent this tiny house and live there for three days. Not sure how it would be to live in one year-round, but many people are doing so. It all depends on what you can and can’t live with, I guess. Minimalist may be good for some people, but not all. Thanks for taking a look. Hmmmm that’s a good idea. I am telling my partner that i would love to live in a tiny home. And lol he gives me a look saying i am crazy. But i like the idea of renting for few days. Just to give yourself an experience of how it would actually feel like. thanks and please do keep up interesting post like this. As a North Carolinian I have to put this on my bucket list of places to check out! Thanks for sharing this! You’re welcome! It’s not hard to find, and there are several for rent in the complex. All the best! Thanks so much for following our blog. I didn’t see a place to comment on yours, so I’m adding it to the one you so graciously left us. Here’s hoping 2017 is a great year for you! I’m in the middle of revamping mine so some elements are still under construction. Hope you all have a wonderful 2017 as well! It would definitely be a wonderful experience 🙂 thank you for sharing. It was fun staying there, and I’d do it again. Meanwhile, I just watch the HGTV show! What a great solution. I neve thought about renting a tiny house, but that would certainly give you an idea if it’s something that would work for you. Thanks for the idea. I, too, would love to rent again. 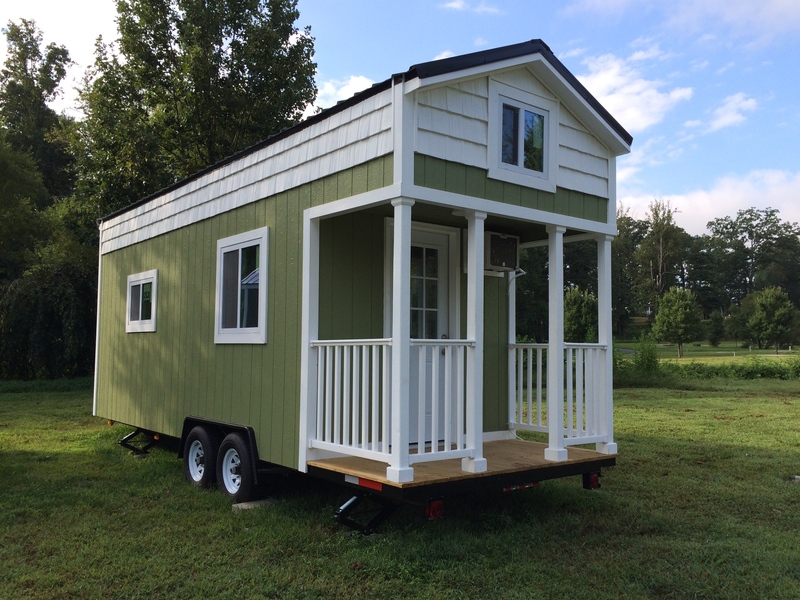 It’s a great way to experience life in a tiny house without owning one! Best wishes for a great 2017! Love these tiny houses! The 400 sq. ft one is the perfect size for me! Tiny houses that have only around 100 or 200 sq. ft would be too small for me. Great post! We did see a couple of tiny houses that were too tiny for me, too. Of course, we could spend a night every now and then in one, but it would be close quarters for sure. I have to have at least enough room for a comfy chair facing the TV!!! I have been fascinated with tiny houses since I saw them on TV. Wanna try this! I’d love to try it again! What fun it was to see all the little places to put things. Lots of storage and livable space. Hope you get to try it! Didn’t know you could rent one. Might have to do that before committing to building one 😉 So many smart solutions. I think I’d love this. We have a caravan so are used to holidaying in small spaces. This is very cute and looks very well equipped. I hope you enjoyed the festival too. Thanks for linking up with #MondayEscapes. Hope to see you again next time! Since you’re used to small space living, you’d love to stay in a tiny house. We loved seeing all the tucked-in storage places — and found that we need less room overall. Festivals are always great — friendly people, bountiful food! Gotta love it. Forget a vacation, I want to LIVE in that!!! This house is a bit larger than most of the tiny houses I’ve seen on the TV show, and much more up my alley with that downstairs bedroom/bathroom combo! What a neat little community to stumble upon, and fun to find you on #MondayEscapes! Thanks for finding me on #MondayEscapes! And yes, it’s bigger than we expected. The porch made it seem even roomier. Loved the space for watching TV as well as that kitchen that had everything in it. This model is definitely more livable for us than the one I showed at the end that was done in a beachy theme. I might not have enjoyed that one as much. Appreciate the comment and your taking time to take a look! 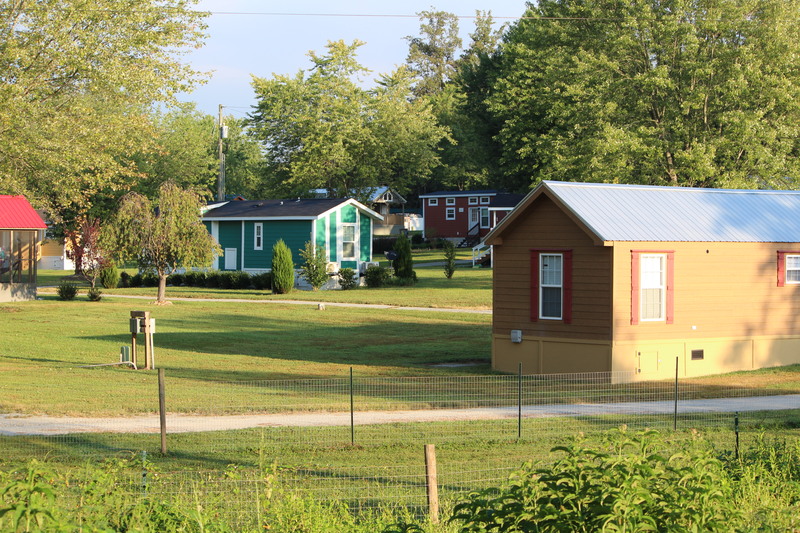 My kids would love to stay in one of these tiny houses! It looks like it had everything you needed for a comfy stay. I wish we could get HGTV in the UK – we watch loads of that channel every time we visit America! I’d love to see you get HGTV in UK. We love the network and all the programs — lets us see what’s happening all around USA. And come visit us more often — maybe stay in a tiny house!! I’m in love with tiny houses! We stayed in one in Alaska and it was spectacular! Thanks for sharing this. I have to look for a place like that here in California. Alaska is one state we haven’t visited, but I’d go in a minute and stay in a tiny house. Thanks for taking a look! You’re so right — we need a lot less than we have. We’ve started weeding out, but it’s not easy! Thanks for taking a look. Wouldn’t it be fun to have both — a big house for most of the time and a tiny house for weekend getaways! Oh, to be so lucky! Thanks for commenting! Yes, I wouldn’t mind vacationing in a tiny house if we had a more sizable house to come home to. You’re so right!!! But it worked for a couple, too. Just glad we took pics before we unloaded suitcases, etc. We can be messy! Love your creativity finding places to stay! This little house looks like it was perfect for your trip! It really was perfect although we had out doubts at first. But there was plenty of space in that little house making us realize that you really don’t need much to make you happy! So cute! I would definitely stay in one one knowing it’s temporary:). I feel the same way — fun for a vacation, but not sure all my stuff would fit!!! Definitely a case of less is more! You’re so right. But it was interesting seeing just how much they could fit in a small space and how little we didn’t miss all the things we have hanging around our house at home. I’ve started weeding out as we speak! We are planning on moving full time into our motorhome (hopefully next spring) so I’ve really been decluttering our lives! We have a number of friends in that area [will be visiting one couple in October] and will have to try it some time. It’s an alternative to motel, B&B, etc. Not for everyone, but fun to see and stay for a few days. I’d love to stay in one of those! So glad there were a few for rent or we never would have been able to do more than walk through one. It made a difference staying there. And I think we could do it often — just for short stays. Yes..I think I could too, of course its just me and that makes a difference. Tiny houses show how little space we actually need. You’re so right, Lulu. We don’t need half of what we have, I guess. But I still shop and bring more home when we travel. Not sure why. Just do! I think it would be great fun – for a vacation! That’s the way we felt. And we couldn’t live in one permanently. It’s a little like staying in a trailer park with few of our belongings. But great for a vacation. Great post with useful information and beautiful pictures. We may have to try this place in the near future. Thanks so much. You might like to try it — for a short stay. But get one that is tastefully decorated and has more than one sitting place — like a screened-in porch. It gives you some separation, if you need it. Fascinating! Want to go in with the Gills to co-own a tiny vacation house at Flat Rock? Thanks for taking a look at the tiny house, Martha. But if we owned one together, only one family at a time could stay there! Oh my. That is a small house. It looks like you found a gem though. When I’ve watched the tiny house TV show, I wondered if living in such a small house would comfortable. I guess it means that the rest of us have too much stuff. It really was comfortable, Judy. And we could do it over and over again for short bursts of time. Couldn’t do it for the long haul. It would be almost claustrophobic!